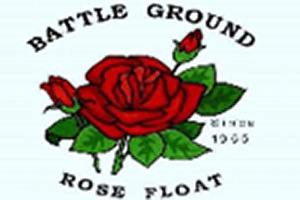 In 1955, Battle Ground, Washington wanted their high school band to march in the Portland Oregon Grand Floral Parade. The band had just received new uniforms, so they wanted to show them off. The only problem was the fact that they needed a float in order to enter their band. Gladis McKinnis decided that they should build a float. The Battle Ground Rose Float committee was born that year. Every year, people volunteer their time to create a float for the parade. They spend most of the year planning and building the float. Each volunteer has something unique to offer the committee, which means that every volunteer counts. The Grand Floral Parade requires each float to be built using only organic materials. While that may seem very difficult for some people, the committee finds a way every year. Each year, the Grand Floral Parade has a general theme that every float should represent. The Battle Ground committee takes that into consideration and discusses their ideas on what their float should look like. They make sure that the idea relates to the general theme. The process to plan and build the float is usually 11 months out of the year. The Grand Floral Parade is in June. A few weeks before the Grand Floral Parade, the Battle Ground committee gives an educational tour for the local school children. They talk about the process they went through and show the children the float. After the float is presented in the Grand Floral Parade, the committee prepares the float to be presented in another parade, the Harvest Days parade held in Battle Ground, Washington. The Harvest Days parade takes place in July, which gives the committee only a month to prepare. The preparation for the Harvest Days parade consists of replacing the flowers with artificial ones. After the float is presented in the Harvest Days parade, the float that they have worked on for months, has finally finished its’ journey. The committee tears down the float and places the memories into their museum, located in Battle Ground, Washington. The committee spends some time to reflect on their previous float, but are silently preparing themselves for the next year’s float!